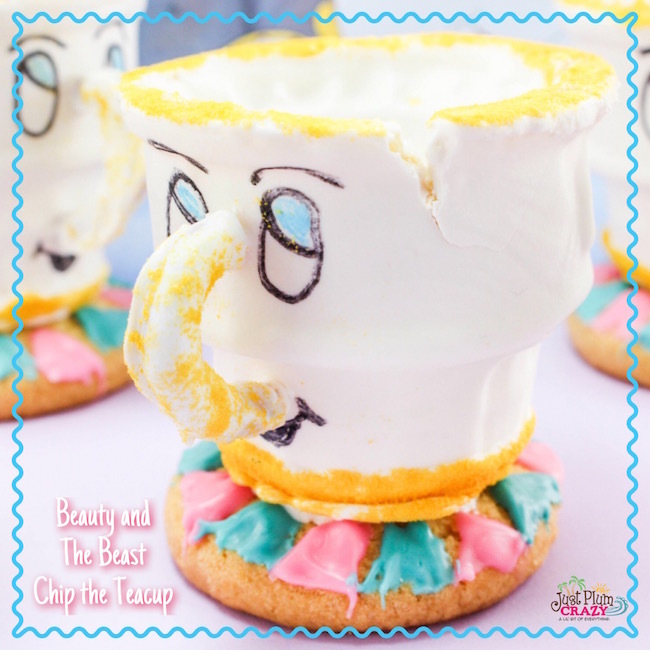 The Cogsworth Marshmallow Pie Recipe from Beauty and The Beast is brought to you by Just Plum Crazy. Cogsworth Marshmallow Pie Recipe from Beauty and The Beast! 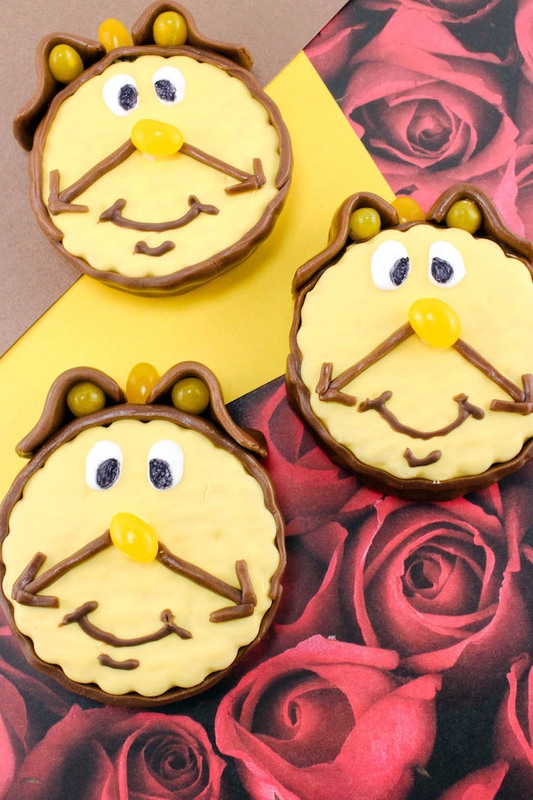 With Beauty and The Beast coming out on Digital HD, DVD, Blu-ray and DMA on June 6th, I thought it fitting that we make something featuring Cogsworth. 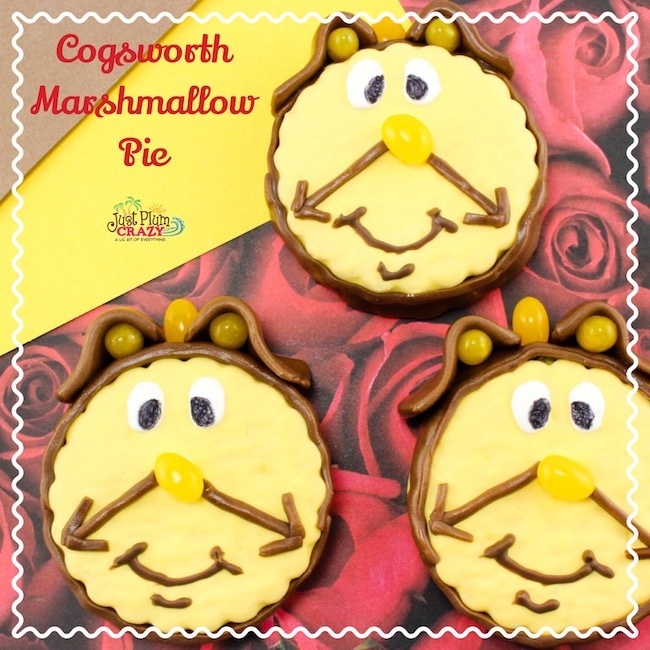 And that’s how the Cogsworth Marshmallow Pie Recipe came to be. 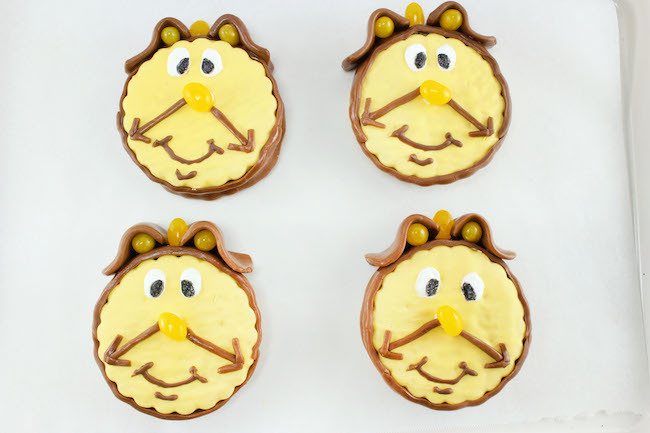 It’s an easy recipe to create and the kids will be in awe that it looks just like him. 1. 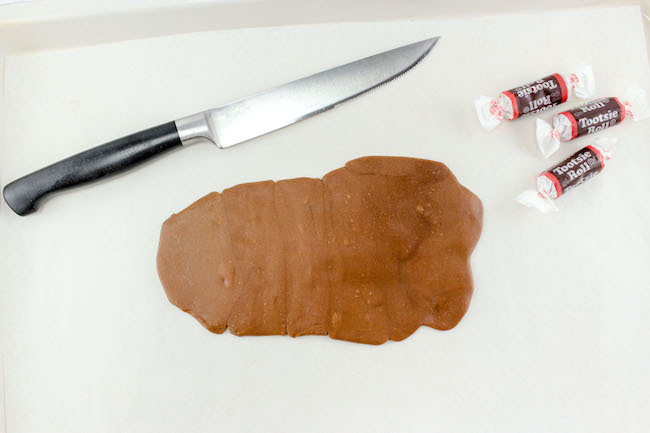 Lay 6 tootsie rolls in a row and microwave for about 12 seconds and press together and flatten out on a parchment lined baking sheet. 2. 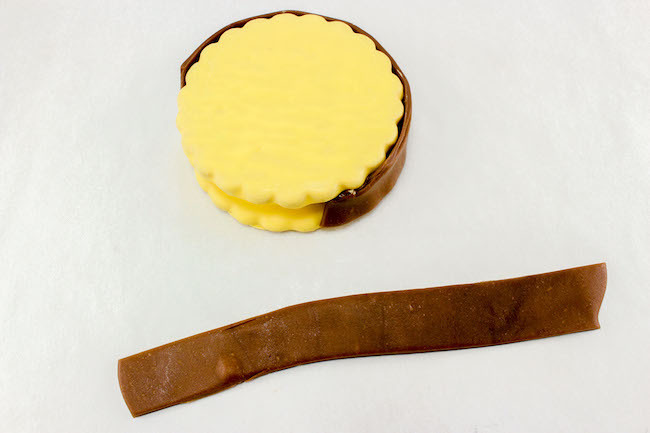 Cut two strips to fit around the marshmallow pie. Lightly press them on. 4. Take the 2 pieces of mantle and place them on the top of the pie. Add a drop of water to the tootsie roll so it’ll stick. Then, take 3 yellow jelly beans and place one in-between the middle of the mantle pieces and the other 2 inside each mantle. 5. 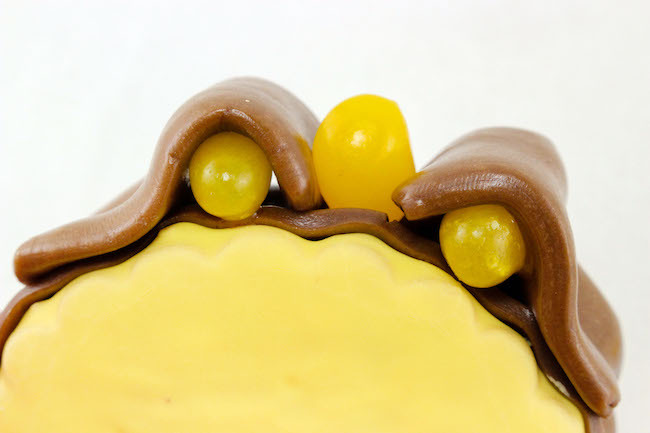 Using white drizzle pouch, attach a yellow jelly bean to the center of pie. 6. 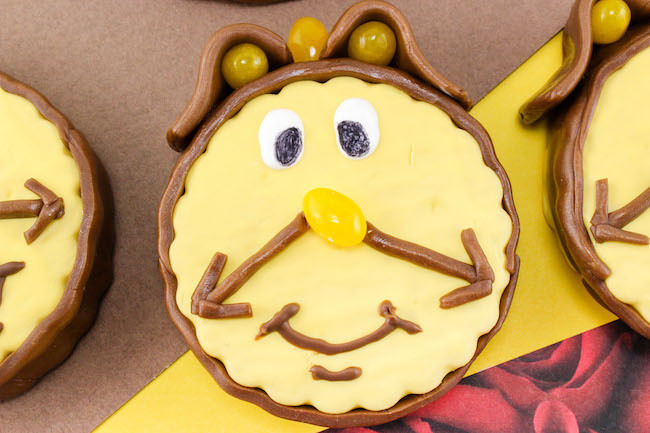 Cut a few thin slivers from the rolled out tootsie rolls and shape into clock hands and press onto pie. 7. 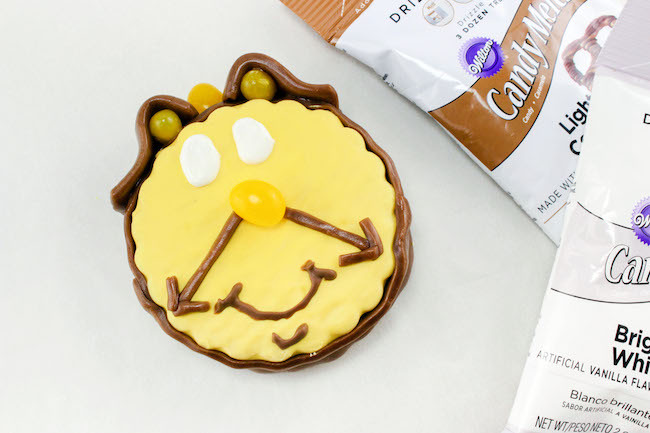 Make 2 little white eyes with the white drizzle and a smiley mouth with the brown drizzle. (Could also draw an open mouth and color in a tongue with a red edible marker). 8. 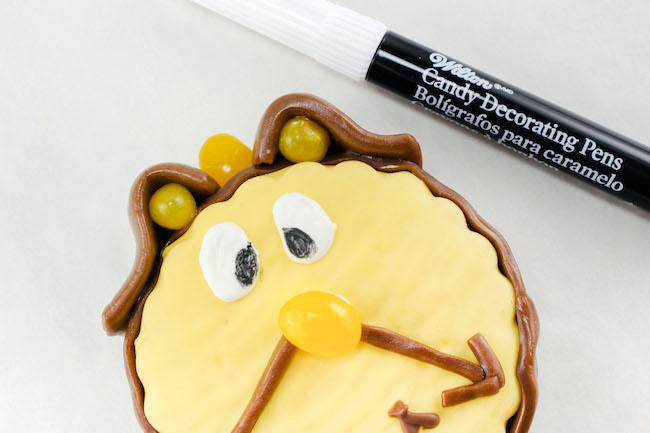 With the edible marker, color little black dots on the white eyes for his eyeballs. 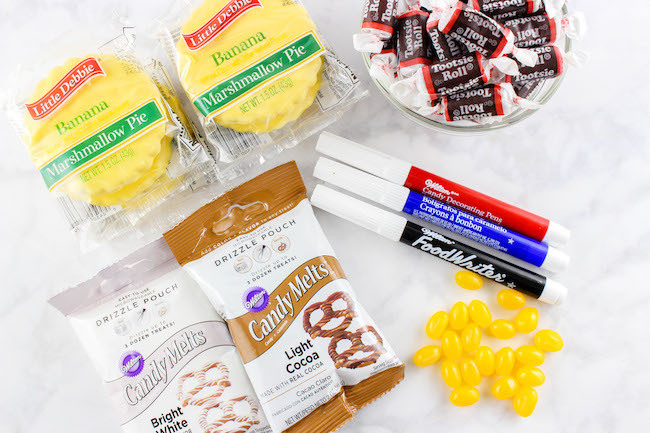 (Can use a blue edible marker as well). 9. 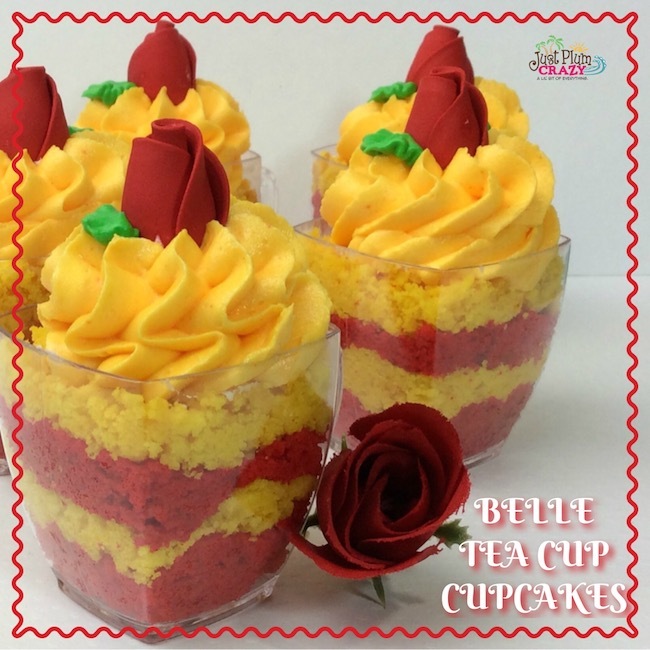 Super cute and easy to make! 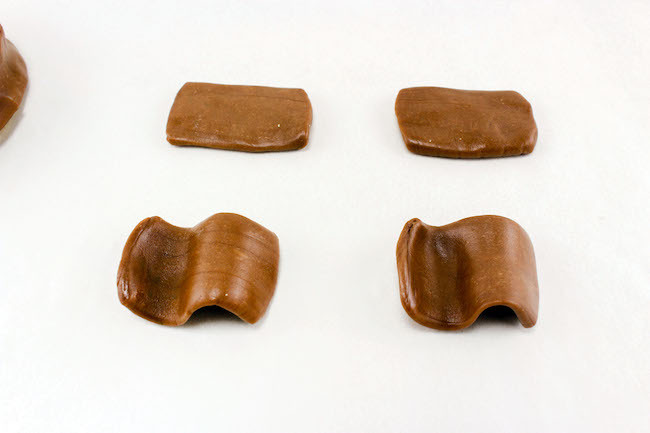 Lay 6 tootsie rolls in a row and microwave for about 12 seconds and press together and flatten out on a parchment lined baking sheet. Cut two strips to fit around the marshmallow pie. Lightly press them on. Take the 2 pieces of mantle and place them on the top of the pie. Add a drop of water to the tootsie roll so it’ll stick. Then, take 3 yellow jelly beans and place one in-between the middle of the mantle pieces and the other 2 inside each mantle. 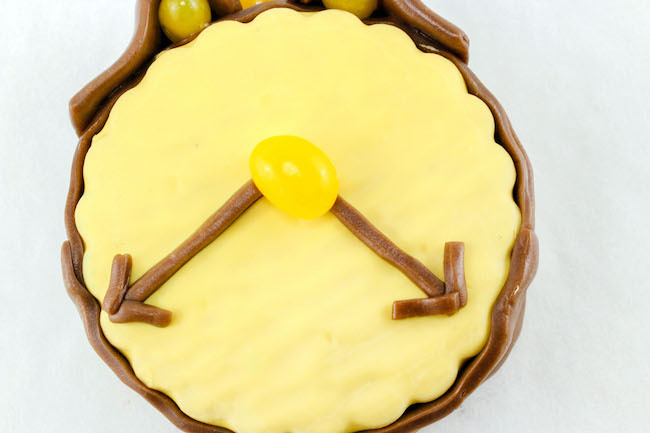 Using white drizzle pouch, attach a yellow jelly bean to the center of pie. 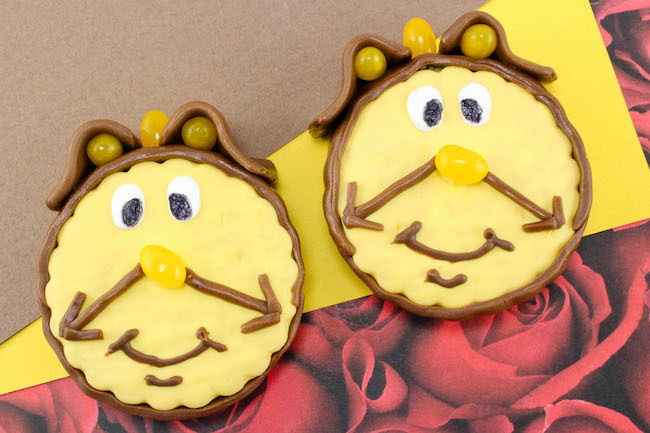 Cut a few thin slivers from the rolled out tootsie rolls and shape into clock hands and press onto pie. 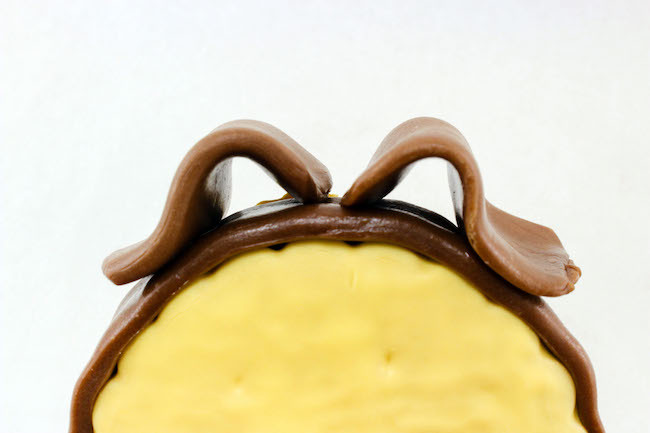 Make 2 little white eyes with the white drizzle and a smiley mouth with the brown drizzle. (Could also draw an open mouth and color in a tongue with a red edible marker). With the edible marker, color little black dots on the white eyes for his eyeballs. (Can use a blue edible marker as well). 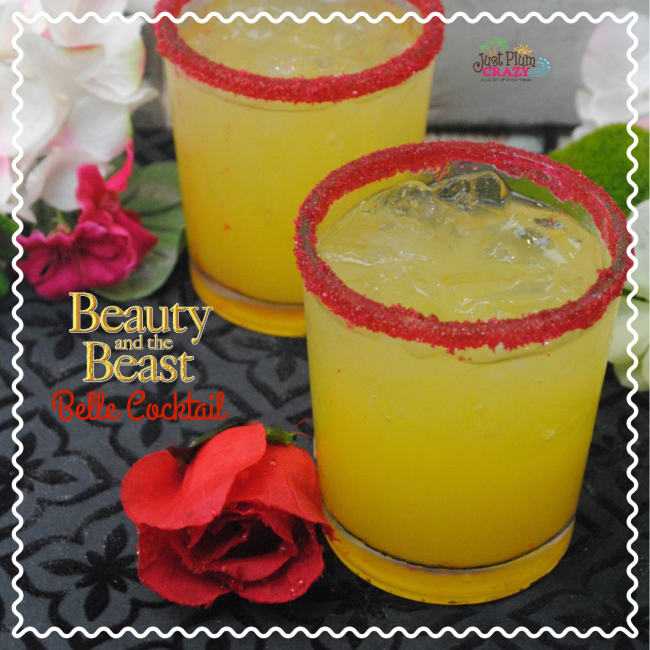 Be sure to check out our Beauty and The Beast Belle Margarita and Chip the Teacup. We will be adding more as the week goes on.